Vtiger’s Multi-module Picklists help to simplify these problems. They are global picklists that you define once and they can be used across several modules through linkage. So, for cases that need common picklist values, all you need to do now is define the values once in the beginning as a global picklist and link this to the picklists of other modules as and when needed. This avoids the difficulty of repeatedly having to add the same picklist values to more than one module. 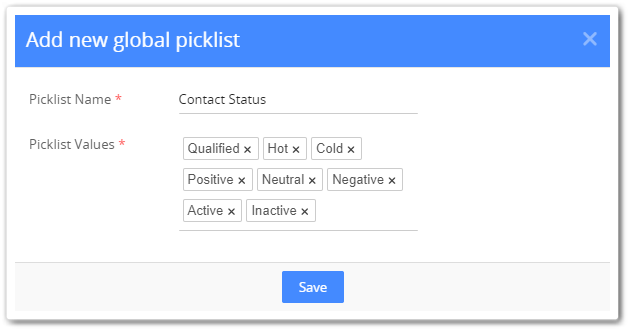 You can create a maximum of 100 global picklists. You can link 1000 picklist values to a global picklist. You cannot add values to a global picklist from the layout editor. Ready to get started? Know more about Vtiger’s Global Picklists here and step-up your CRM game. Sign-up for our free trial to experience the power of Vtiger!